Non-Guest Article: They Would Have Changed it Anyway? Shortly after Diablo III debuted last June, a vocal minority of fans raised a great cry over the “too colorful” nature of the game. 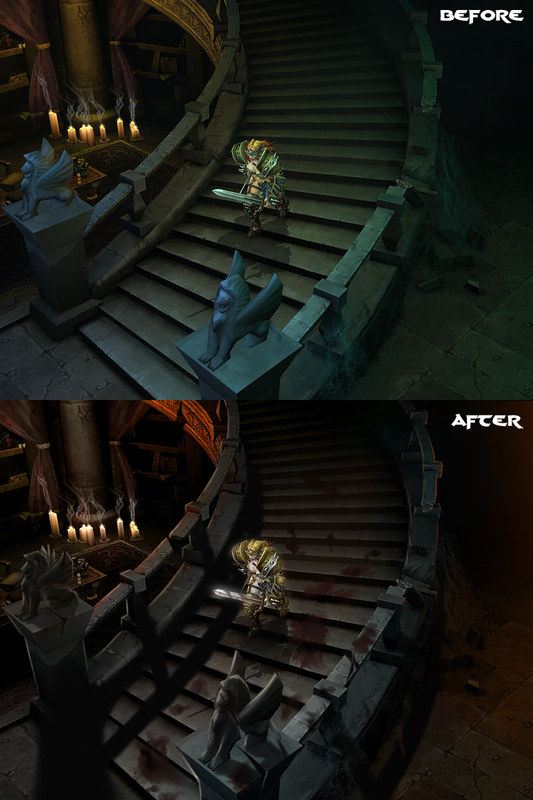 The basic complaint was that D3 was too colorful, that it wasn’t dark and gothic and moody like Diablo II, and that it was too WoW-influenced in design. Great quantities of fan-tweaked screenshots appeared, and eventually even a very slick color-adjusted movie. Blizzard replied to this by defending their D3 design goals, pointing out that D2 was much more colorful in reality than in memory, and by elaborating on reasons why the look achieved in fan-photoshopped screenshots.wouldn’t work in the game. That said, the D3 Team did admit to taking some inspiration from the fan comments; they decided to limit the rapid roadkill evaporation of dead bodies, and said they were adding more grit and rubble and working to grunge up the game environments. What’s this got to do with the interface remodeling seen in the new Blizzcast shots? Just this. Fans are still complaining (often with the use of sarcasm) about the ways D3 has evolved from D2, and some are still blaming WoW for every change they don’t like. That’s their right and privilege, and if we all agreed on everything about D3’s development, the forums would be pretty boring. Aside from the fact that WoW is one of the most popular RPGs of all time, and the fact that most fans like the game’s look and even approve of the WoW influences, how sure are we that the fan uprising during the color controversy actually caused Blizzard to do anything they wouldn’t have done anyway? Look at the major changes they’ve made to the interface and other menus and windows, in just six months, and without any populist prompting. Don’t you think they would have realized the game looked a bit too clean and antiseptic, even if the fans hadn’t complained after the debut? The version of D3 we saw at the WWI debut last June was still quite an early version of the game. Way, way pre-alpha, with obviously temporary menus, interfaces, and more. The first act was nowhere near completed, the characters were still rough drafts, and the world graphics, though they looked good to us, were far from complete. Yes, Jay Wilson said later that some settings were being adjusted to add more gore and blood and bodies, allegedly because they thought we fans had a good point when we demanded that change, but that change was probably inevitable. Doesn’t every 3D game engine start off looking very clean and smooth? Textures and graininess and visual noise and all the other little details get added in over time, as the artists fine tune the graphics. How much debris and other remnants and destructibles can be left lying around is a balance between visual appeal and machine performance. So yes, fans wanted more of that sort of look, and the game is now delivering it (with more improvements yet to come, since we’re still fairly early in the development cycle). But there’s no way to know how much, if any, of the changes are direct results of fan comments, and there’s really no way to know if the D3 Team would have made them on their own, sooner or later. This “guest article” was written by a site staff member, but we’re looking to incorporate more editorial, blog-style pieces into the site news. If you’re interested in regularly or occasionally submitting blogs to Diii.net, get in touch with Flux.